The classic dinner, dancing and silent auction template is often a fun way for nonprofits to raise some money and gather their core community of donors. But the Rotary Club of Carbondale decided that using Hollywood-caliber hurricane fans to blow inflatable balls down Main Street would be even more fun. The rotary met with the Carbondale Chamber of Commerce to pitch their idea, and this First Friday, Sept. 7, will mark the inaugural Running of the Balls. Originally a spinoff from the beloved Ducky Derby that the Rotary Club of Aspen holds every year, the Carbondale rotarians are offering a $5,000 grand prize to the race winner. 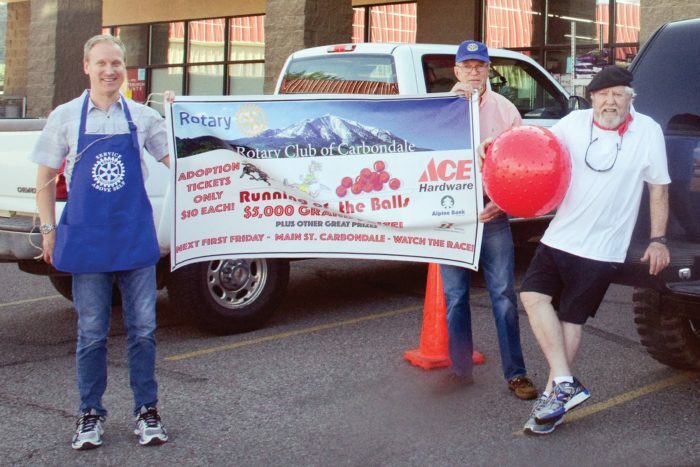 If all goes well, Frank McSwain, a longtime member of the Carbondale club, hopes that the Running of the Balls can become a keystone event for the rotary. It’s certainly going to be a hard-to-miss event if you’re out and about, and that’s part of the point. And it’s not just the race itself. That splash has the potential to make real waves. As an entirely volunteer-based organization, the Rotary gives away basically all the money it takes in — even the nonprofits they’ve partnered with to sell tickets to the Running of the Balls keep 80 percent of their sales. “We wanted to incentivize them by saying, ‘Hey you, can keep the majority of the funds you raise selling this,” Cole said, listing Youth Zone, Ascendigo and Sol Theatre as their partnering organizations for ticket sales. An event of this caliber, of course, does not happen without larger corporate sponsors — and in this case, even another Rotary. Carbondalians interested in Rotary have two opportunities to explore: The Rotary Club of Carbondale meets at 7 a.m. at the fire department, and the Mt. Sopris Rotary meets at noon at White House Pizza. That doesn’t mean the two clubs view each other as competition. The Running of the Balls is a big project. Ace Hardware is the titular sponsor, and ANB Bank, Alpine Bank and Heartland Environmental Services all deserve special shout outs, Cole emphasized. If it’s a hit, those funds will go toward furthering the number of scholarships the Rotarians give local graduates and ensuring even more third graders receive free dictionaries. It could even mean more women in Niger learn more sustainable farming methods to ensure financial independence for their families. Trivia: It was originally called Great Balls of Fire, but given this year’s trauma, the rotarians thought better of it. Maybe next year.